info(at)seashell-collector.com której dział ? ?Worldwide Collectors? pozostaje ciągle ?punktem zbiorczym? miłośników muszli, także z Polski. Odwiedzając stronę, nie można pominąć: ?Online/Offline Articles? ? miejsca dla cierpliwych amatorów lektury internetowej, czy też: ?Live Seashell Database? ? uroczej galerii mięczaków w naturalnym środowisku. David Touitou nie ogranicza jednak swojej kolekcjonerskiej aktywności jedynie do administrowania strona internetową. Przede wszystkim jest: obieżyświatem, wytrawnym nurkiem, autorem artykułów do francuskiej – ?Xenophora? oraz angielskojęzycznego – ?The Cone Collector?, członkiem Association Francaise de Conchyliologie?no i właścicielem potężnej kolekcji. I hope you all enjoy seashell-collector.com website which needs a lot of work regulary. Modern databases are addend actually. Two are done and the one concerning worldwide collectors will be done next. It will be a powerful mean to link collectors from all countries and be a base for shell exchange. I wish a long life to Jacek website and happy shelling to all Polish Collectors !!!? ?My name is David Touitou. I was born in 1975 in the city of Toulon (South of France). I studied for 7 years in Marseille City (South of France) at the Medical University and became a Pharmacy Doctor in 2000. Since my childhood, I always collected stuff (stamps, coins, shells, rocks…). I had the chance to go „often” with my parents to one of the last preserved paradise on earth : The Seychelles Islands. There I always searched along the granite rocks in shallow water in order to find freshly dead shells. The only shells I found that way were the very common snake-head cowries (Cypraea caputserpentis) and sometimes a common histrio (Cypraea histrio). In 1997, I found while snorkeling in 3 meters of water, a GEM freshly dead amazing cowrie… It was green colored and had many very nice light spots. I was really astonished by the beauty of that shell. Only to findout it was just my first eroded cowrie (Cypraea erosa). This find launched me in the shell collecting exciting hobby !! We can now say that I really started shell collecting in 1997, because after I came back to France, I tried to meet other collectors and I met Mr Roger Rault with whom we launched this website in the late 1998. Mr Rault taught me so much, he was my mentor in this wonderful passion. Unfortunately Mr Rault died in 2003 and we all lost a great collector. I started then to collect Cowries. I collected some in the Seychelles and try to build a worldwide collection like many of us by buying shells from dealers and collectors. In 2001, I settled in Martinique Island for 18 months and started to collect Cone Shells as cowries were not so prevelent there (5 species only)… And Cone Shells really got me !! I became a Cone Shell collector since this stay. I, of course, still collect cowries, but my favourite family remains Conidae. I started also at that time to change my way of collecting. I abandonned the worldwide collection and stopped all shell purchases. I prefer to collect shells by myself and build a self-collected collection from the countries I would travel too. 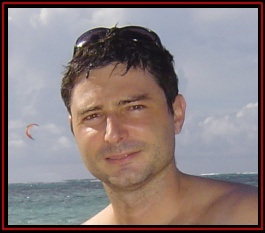 After these 18 months in the Caribbean, I moved to Pacific, in French Polynesia in 2002. I will stay there on Moorea from 2002 to 2006. I wil mainly collect Cone shells there and managed to collect shells in New Caledonia too. I moved back to France in august 2006 with family. ?